A job interview is your gateway to winning or losing the job. It is a formal procedure to assess your fitness for the job profile. The most important trait that forms the basis for judgement is your “Attitude”. It can make or break the prospects for you. Along with verbal communication and the ability to comprehend and respond appropriately, Body Language has a an important say during the interview process. This trait is like a glove in hand, the hand being your skills and qualification. Whether you’re an senior executive or a fresher, interviewers give prominence to your body language that helps them immensely in the selection process. 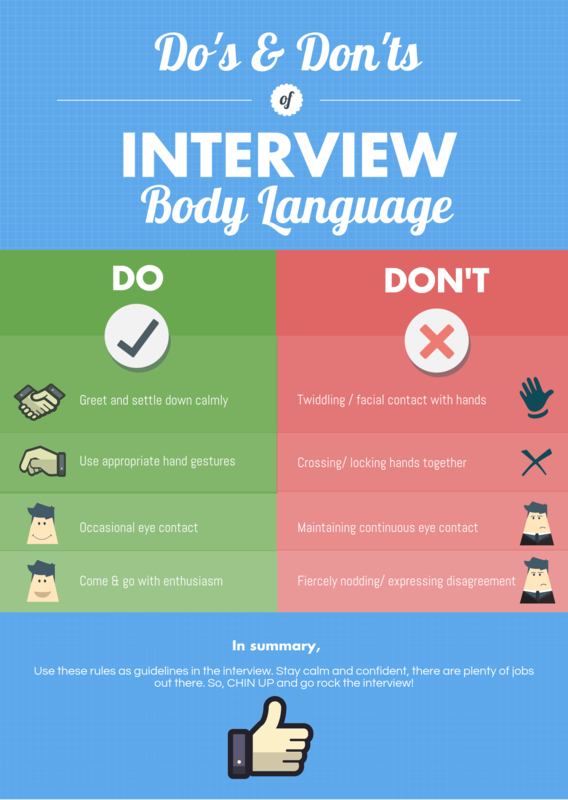 We have listed down some of the most important Do’s and Don’ts of body language during an interview. You can make your own list based on past experience and on the basis of discussion with family and friends. As soon as your enter the interview room, walk up straight to the interviewers, shake hands with a smile and introduce yourself only by name. Let that hand shake be firm and smile light. Sit down calmly, firm on your seat, when you’re asked to be seated. Be audible and slow in speech. Use appropriate hand gestures that syncs with your emotion. Nod your head when required as a sign of acceptance. Bodily movements are a great way to showcase your ability to multi task and signifies positive attitude. One of the most crucial aspects of body language during an interview. Do not shy away from looking into the eyes of the interviewer or the panel and at the same time do not engage an eye to eye contact for long durations. Make it a point to look into other parts of the face and keep switching intermittently. Always remember, the decision to select you is not concluded immediately. The interviewer takes time to analyse key phases of the interview. After calling it off, do not get up and rush abruptly to exit. Make a polite exit after thanking the interviewer. Scratching head or face during the process is a strict no, no. Doing so frequently can be considered a sign of nervousness where you’re trying to cover up gaps in speech and thoughts. Also, from a generalist point of view, it can be considered unhygienic. It ceases your ability to move freely, to make gestures and so on. It also gives room for the interview to perceive some traits such as resistance. Therefore, if you’re standing, keep them straight down with free movement and if seated, use them for gestures and signals. Avoid staring into the eyes of the interviewer(s) for a prolonged time. It serves no purpose and may be intimidating for the opposite party. It also causes disorientation after end of specific discussion. Avoid disagreements if possible since you have not much to lose if you do. If need be, make a gentle nod and speak up assertively expressing your views. Nodding excessively and making lewd gesture to express displeasure can be offensive which may have big impact on your selection or progress further. In addition to the above, there are little things from your body language that make or break it. Always stay optimistic and remember, there are millions of job opportunities in the market today.